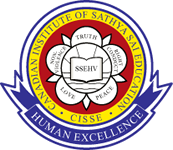 The founder of Sathya Sai Education in Human Values Program is Sathya Sai Baba, who was a renowned educationist, humanitarian and social reformer (1926-2011). Though he lived in India, his work has inspired ongoing educational, medical and service projects around the world. His projects are unique and targeted towards transformation of the self, family and society. His projects have been based on the universal values that form the foundation of the world’s major religions: Truth, Righteousness, Love, Peace and Nonviolence. The eight words - "Love All, Serve All" "Help Ever, Hurt Never" best summarize his life and his teachings. Education: Sathya Sai Baba placed great importance upon strong education for all young people. He established a model education system in India, which includes primary schools, secondary schools, and an accredited university with three campuses, offering undergraduate, Masters, and Ph.D. degrees. No fees are charged to students, and admission is open to all. Sathya Sai Baba launched a unique educational program aimed at integrating values in an innovative way into the school curriculum in rural and under-equipped schools in India through the internet. Managed by the reputed House of Tatas, all lesson plans include a values component, emphasizing that education should not be just about information but transformation as well. Health Care: Two ultra-modern super-specialty hospitals and one general hospital built by Sathya Sai Baba at Puttaparthi and Bangalore offer free treatment to everyone who comes there, especially the poor. Highly specialized operations, including open-heart surgeries and kidney transplants are routinely performed. There is absolutely no charge to the patient for professional or hospital expenses. Motivated by the desire to serve humanity, doctors, nurses, and workers in the hospital render extraordinary, compassionate, and loving care to all patients. The hospital premises are maintained in a clean, calm, and serene atmosphere. Sri Sathya Sai Super Specialty Hospital, Puttaparthi, India provides medicare at no charge. Environ-care: Sathya Sai Baba undertook a project to provide an adequate supply of pure water to 1.5 million inhabitants of the State of Andhra Pradesh (India) who were living in drought conditions. The Prime Minister of India inaugurated the project. The water was made available to the people of 750 villages in just 18 months. After a year of regular operation, the entire water project infrastructure was handed over to the people of the state as a gift. Another water project provided water to a city of 8 million people. 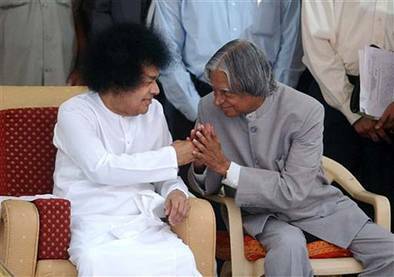 Sathya Sai Baba demonstrated that it is the duty of society to ensure that all people have access to the basic requirements for the sustenance of human life. Service to those in need: Sathya Sai Baba initiated a number of rural service projects that give students at his colleges and universities the opportunity to practice service to mankind. Other service projects give skills training to the rural poor, to help them develop self-sufficiency and a better quality of life. Equipment such as lathe machines and sewing machines are distributed free, to provide means of self-employment to villagers.